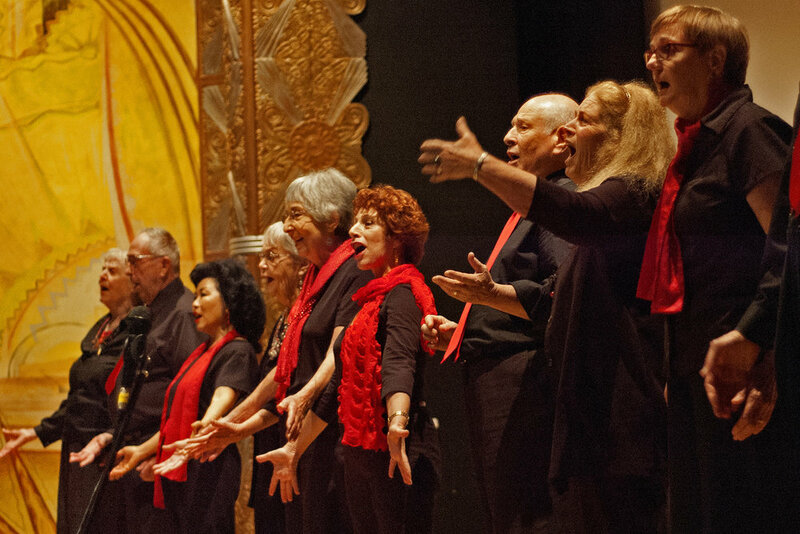 As Stagebridge's longest running show, Never Too Late entertains Bay Area groups throughout the year. Its talented cast offers a topical mix of skits and songs that treat everyday experiences with compassion, wisdom, harmony, and a healthy dose of humor. Led by Artistic Director Joanne Grimm and Musical Director Scrumbly Koldwyn on the piano, the stars shine brighter each year, and their winks and nods to memory lane leave audiences with a laugh and a smile. Never Too Late is presented in various public and host-sponsored venues. Shows typically run from 40-60 minutes and can be customized for seasonal, holiday or special occasion themes. To inquire about bringing Never Too Late to your organization's special event or venue, contact us by phone at (510) 444-4755, by e-mail, or via our online booking inquiry form.